With spring coming our way in a short(ish) amount of time, my thoughts have turned to warm weather tops in super cute prints. As much as I love winter I get tired of the monotony that comes with heavy sweaters and layers and layers of clothes. 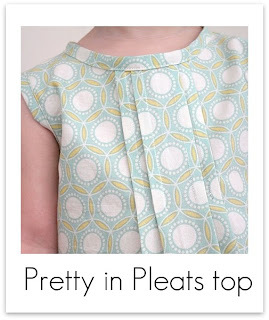 So this adorable pleated top by Jessica over at Craftiness is Not Optional is the perfect project to get you ready for warmer weather! This entry was posted in patterns by Stitch To Stitch. Bookmark the permalink.